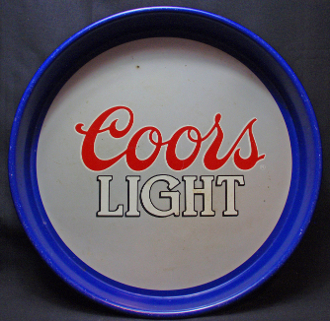 Coors Light Beer Tray measuring 13" diameter with a 1 1/2" dept. Nice tray with some scratches, dents and rust. Marked on back copyright 1983 Adolph Coors Compay, Golden, Colorado 80401, Brewer of Fine Quality Beers Since 1873. Nice tray obviously say some bar use. Great collection starter.